Card Review: 8.9 I've always like this card, and set for that matter. It's very similar to the '96 Pinnacle design, yet that one is awful. Little details make a big difference. 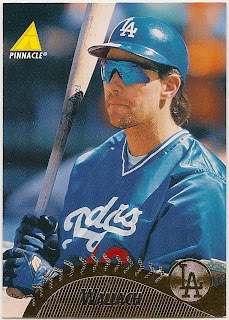 Fun Fact: You may notice that the batting helmet Wallach is wearing on this card has no ear-flaps. The Wikipedia page for "batting helmets" list Wallach as one of the four last players to wear a flapless helmets after being grandfathered in when they were banned in 1983 (Tim Raines was the last player to wear one in 2002 with the Marlins). I've never actually seen a photo of Wallach wearing flapless helmet in an actual at-bat. I believe he only wore them during batting practice. 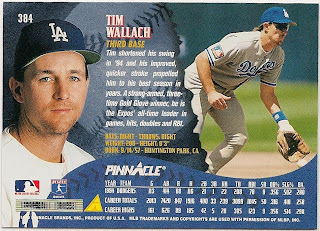 I collect Tim Wallach cards (as well as anything else Tim Wallach related).